How lovely that so many of you enjoyed the photos of Phin! I really didn't expect his handsome self to be so well received. Yes Kristine, I will try to post some images of Winston sometime soon. Maybe I should just bring him over for you to see up close and personal! Ha! 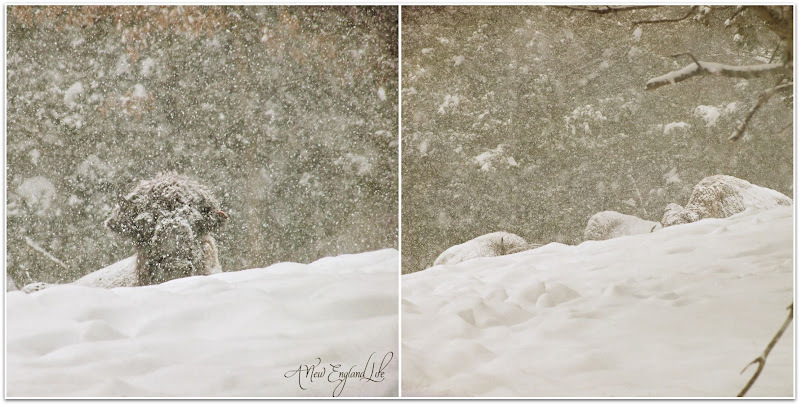 I hope you all enjoy these images I shot during one of our many recent snow storms. If you've ever been to New England then you've seen the endless granite stone walls lining fields and property lines, running along the sides of roads. I always wonder how land owners had time to build so many miles of them. It had to be a huge undertaking. Photographers, tourists, and locals everywhere are just so glad they did. So many times I've stopped at the gate to see the Buffalo at a local farm. Everytime I come up empty handed or with a photo of a dot on the horizon. For once they were actually within viewing distance but difficult to see through the heavy snow. On the left is a single Buffalo, on the right are several of them standing just behind the hill. The one on the left kind of looks like Snuffleupagus from Sesame Street. I felt so bad for the Gulls. Weather like this is stressful on the wildlife. I love it when the snow falls. The air feels fresh, crisp, and easier to breathe. It makes everything look pure and beautiful, especially the old, dirty snow. At this point we don't have any storms in our future and I'm a-ok with that. With a 1-1/2 to 2 feet of snow on the ground I do believe we are all set for a while! 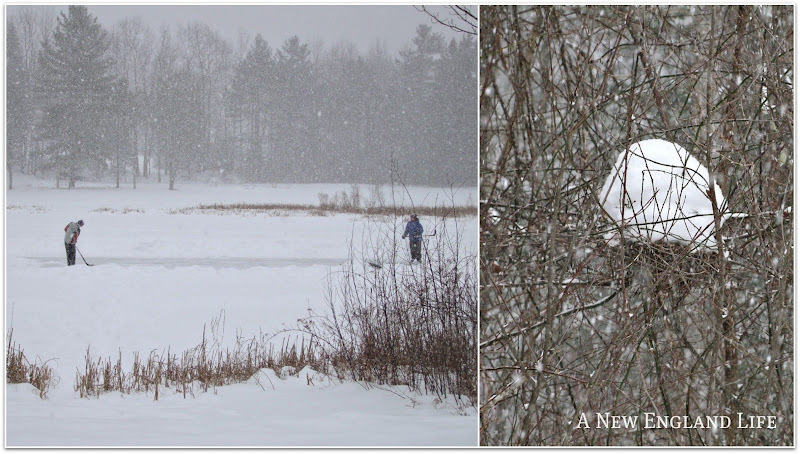 Some very beautiful pictures - classic NH winter. I love it. Skating on the pond and Cardinal...mmmmm. Nice. 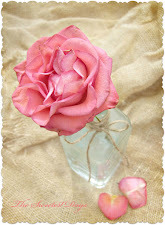 Your images are moody in very good way! Your photos are simply incredible, Sharon. Your snow scenes are wow! And that lady cardinal is divine! Beautiful photos! I think the cardinal is my fave! I hope you don't get anymore snow... stay warm! Thank you so much for sharing these absolutely stunning photos! I've always loved those long stacked rock walls in the New England are! The birds are lovely! 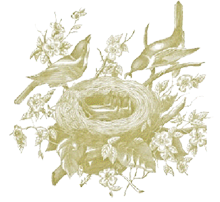 Can't believe the snow on the bird's nest - wow!! 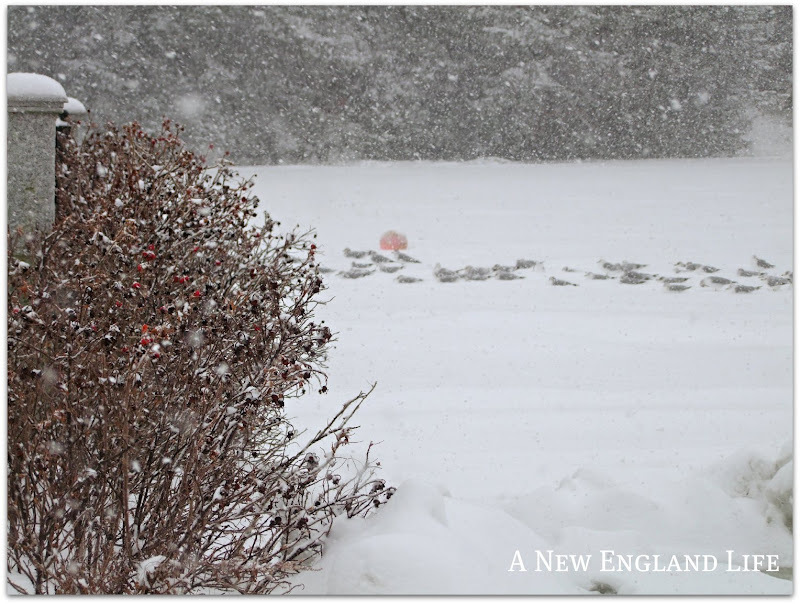 I want to live a New England Life! I think I love it there. Beautiful winter shots. Snow is so pretty when it is on the trees and grass and off the roads and sidewalks. No snow for a while. Fine with me. Sharon, wonderful images! I'm sure you, like me, are looking forward to spring! Winter's about worn out it's welcome! These shoots are wonderful...they are so magic! So beautiful Sharon! I especially love the pictures of the cardinals. They look magnificent against the snowy background. So glad you told us those were buffalos ~ never would have figured that out otherwise. Hope you and your daughter are well. Thanks for sharing all of your beautiful photos! I always visit, enjoy and study your beautiful photos (though I should leave you a comment more often). I love the way you "catch" your surroundings and nature around you so beautifully. I love that first shot so much Sharon! It looks like a winter fairyland! And your cardinals are splendid too. 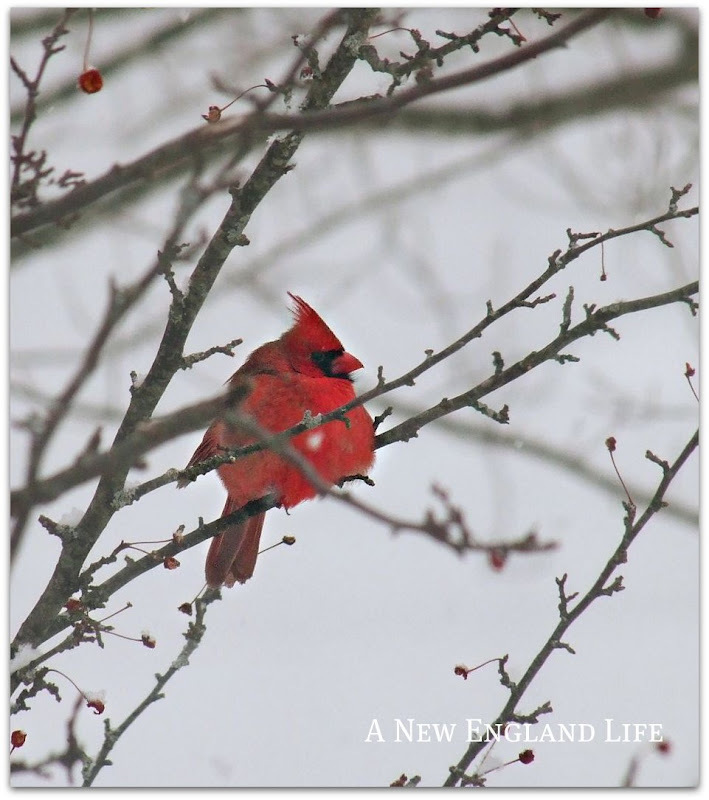 Fantastic Photo's as always, I love the red cardinal's, we don't have them over here, they are beautiful birds. The Cardinals steal my heart! A super duper set of photos, Sharon. Especially your shot of the cardinal through the railing... I've been trying to catch a shot of one recently as well but they are just so skittish. 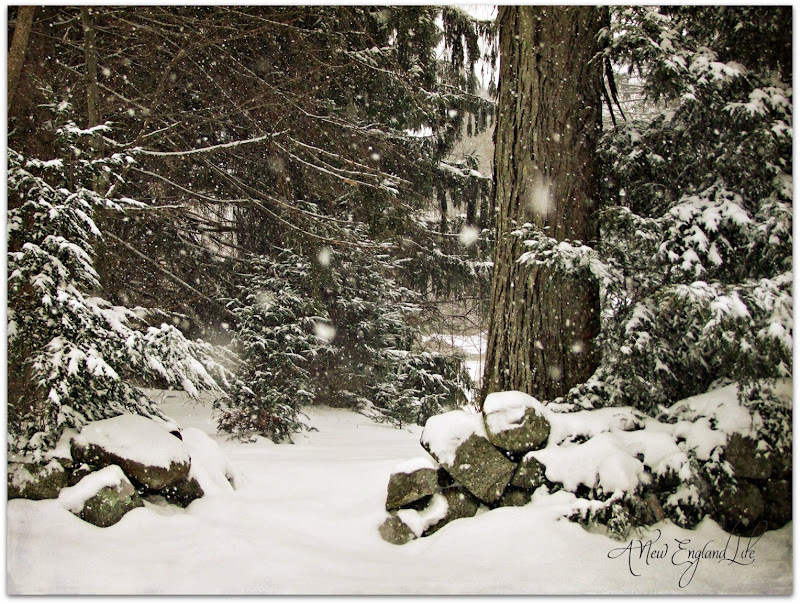 Gorgeous wintery New England scenes! I too especially love the chubby Cardinal! Once again, your pictures made me smile, snow and all. I agree no one needs anymore snow. Have a good weekend. I don't think that there is a prettier picture than a cardinal in the snow.....although the shot of the stone wall is a close second! Just beautiful! 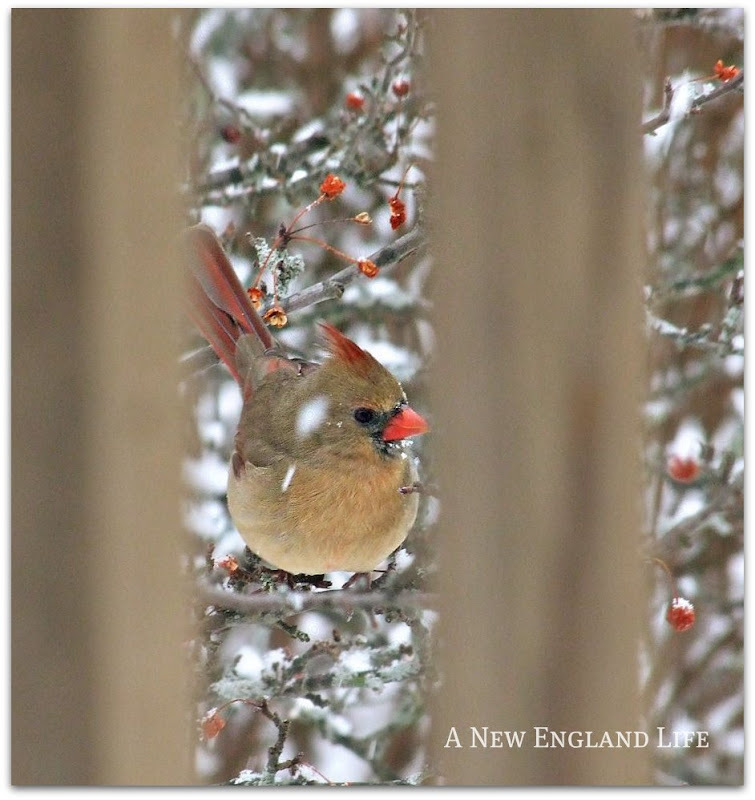 I love your photos, especially the lady cardinal - stunning. I did similar photos measuring the snow depth with my hitching post before snow and after the most recent storm! Have a wonderful weekend! Absolutely beautiful - the chuch and cardinal are my favorites! Loved that red "fat" bird!! Oh, what beautiful shots...from the cardinals to the church and the buffalo. I have never seen one covered in snow! You're right, he does resemble Snuffleupagus. I so enjoyed seeing Phin and never got back to tell you so. I peaked on my phone while at home. Yes I worry about the animals too this time of year. Saw 9 deer the other day in the back yard. I wanted to leave them food but G thought that wouldn't be a good idea. errrr! Wow, so many beautiful images. You've outdone yourself! The first shot looks like an illustration for a children's book, I looked to see if I could find a wizard or a fairy hidden in the branches. And, the birds are fantastic! Especially the first one, puffed up like a cotton ball. I wouldn't have spotted the buffalo, had you not pointed them out. Especially the ones on the right side - I thought that was a before & after shot and those humps were hummocks in the landscape. I always wonder how the poor birds & animals cope when the weather dips. Somehow they manage. I don't know how. sadly, all our snow is gone at the moment...because I love snow! Gorgeous - it's like a winter wonderland. The kids love the cardinals! All beautiful photos, but I believe the bird shot through the rails is my favorite. Very nice. These snowy pictures are beautiful! I too love the stone walls that run through New England. They are beautiful and historic. When I saw the photos of the bison, I thought the one on the left was a dog, till I read the words. The ones on the right show their humps, so are instantly recognizable. 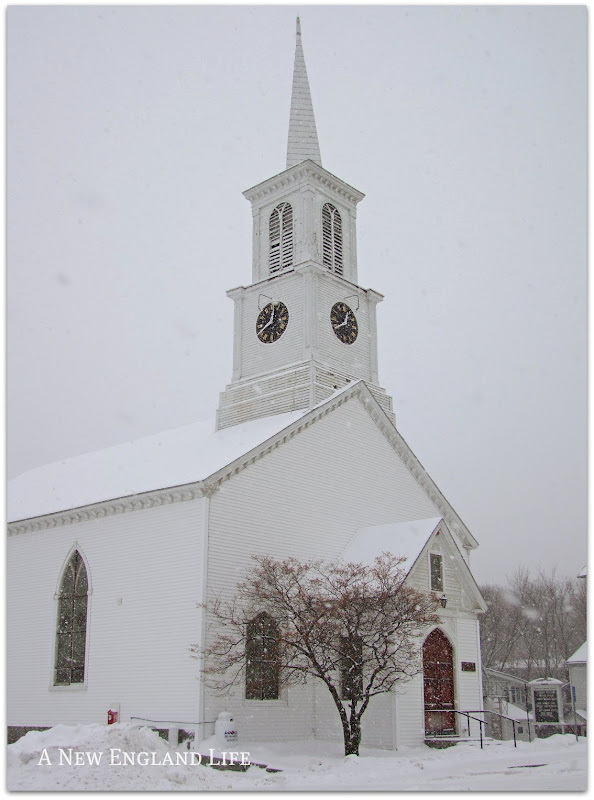 Beautiful shots, I love those New England styles for their churches, pretty but cold. The winters drag on over here and when it snows, the whole country halts. Love the Cardinal great shot of him too, I am sure he will have a good food supply from that tree.